The tournament itself is an ever-growing success story of its own. This year’s event played host to 23 teams and 235 players, the highest level of participation yet. We were particularly delighted that three teams each from NTT Data and everis – both of whom are part of our Group – flew in specially for this year’s tournament. One factor behind the success of the itelligence Soccer Cup is, of course, the location. It was a Dutch employee who told our sports director Dieter Schoon – in real life our HR manager – about this fantastic location via our talent promotion scheme Delta Teams. Every time we travel to this rural farmstead, which has proven to be the ideal venue in every respect, it’s like going on a fun school outing. As soon as we arrived on Friday afternoon, we chose our rooms and inspected the four pitches. Some of us also found time to have an informal kick-about. As soon as we arrived, I was struck by the friendly atmosphere and idyllic location. This put us all in the right mood to talk about soccer tactics, the upcoming group draw and the next day! The evening meal was the ideal opportunity for everyone to get together in a relaxed atmosphere and meet their fellow participants. Then it was time for the draw. From the winner’s trophy, Dieter Schoon drew the names of the 23 teams, which were then divided into four groups. As you can imagine, this provoked plenty of chat as well as lots of serious – and semi-serious! – opportunities to discuss the supposedly “most dangerous” opponents and possible tactics to conquer them. The brilliant sunshine early on that Saturday morning heralded what would promise to be a fun and good-natured tournament. And at 9 a.m. sharp, the first game kicked off! 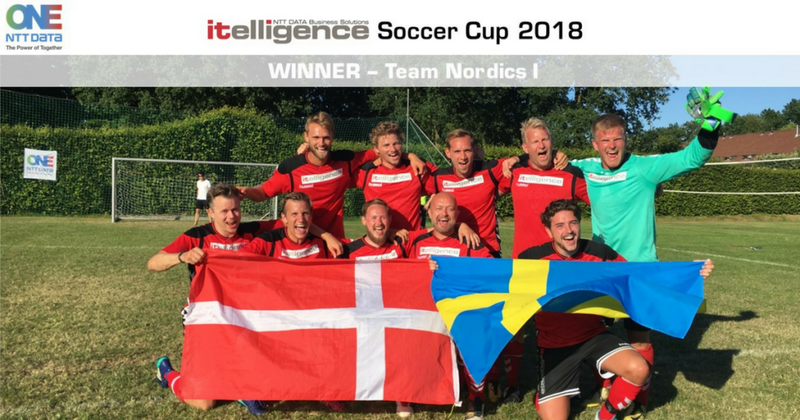 The fighting spirit was awakened in an instant, and those hard-fought opening games were ultimately won by the teams from everis UK, everis Barcelona, IGMS Germany, UK I, Nordics I, Germany (GISA), everis Madrid and Russia. From these eight teams, we created two groups of four. Over the course of some exciting and entertaining games, the first two teams from each group then went through to the semi-finals. But for the other teams, the tournament was far from over as they played “lucky loser,” battling for places 9 to 23. But in a tournament like this, everyone’s a winner. The schedule meant that more than 115 games were played over the course of a single day! Musical interludes were provided during break periods to bring variety to the proceedings, while teams that had pushed themselves to exhaustion were occasionally allowed to settle their games early with penalty shoot-outs. 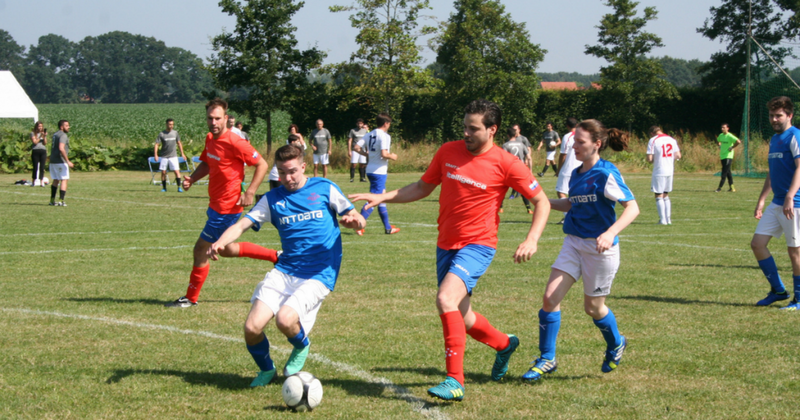 The hard-fought semi-final matches saw the Nordics team beat everis Barcelona and the GISA team beat everis UK. In the end, the final was won by the Nordics team, who beat Germany GISA 1:0. The winning goal was scored by the unstoppable Rasmus Bennedsgaard, who was also the top scorer in the Soccer Cup as a whole. The biggest winner of the tournament, however, was our team spirit. After a whole day of highly focused fair play, nobody suffered any serious injuries. For us, that all-important team spirit was evident even before the teams were put together: If any players were missing, we simply “borrowed” other players from our international colleagues. In the evening, Dieter Schoon presented the trophy to the winning team from the Nordics region. All the teams then celebrated for as long as they still had the strength, with a DJ providing a musical backdrop. 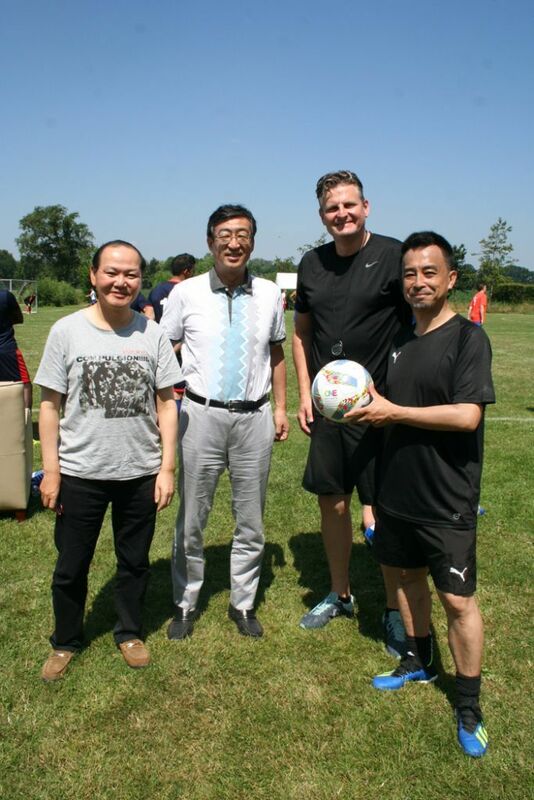 Our sports director Dieter Schoon – together with referee Manabu Tanaka from NTT Data – also played their part in ensuring a fair and successful competition. This tournament is a fantastic opportunity to not only enjoy the soccer but also to share knowledge and network with colleagues from other countries. This was a really fun way to break down national and company boundaries. In today’s world, agility, flexibility and curiosity are vital traits that have to be nurtured. This is a really great event, I will try my best to bring a team from Japan next year over! An ever-growing organizational team ensured that this year’s tournament was once again that little bit even more “professional.” As they did in the previous years’ tournaments, our colleagues from the Netherlands ensured that everything was in place to guarantee a fantastic tournament, which is why we have every confidence that next year’s event will once again attract numerous itelligence teams so that our colleagues from all over the world can gather together at this sporting and social highlight. This is our company – a place where we can learn and grow! Marvin started his career as an inhouse consultant in HCM AMS. Afterwards he became the Executive Assistant to Global Head of People. Since October 2017 he is taking the responsibility of the Competence Center People Analytics. He is an ambitious football player, drummer and loves travelling around the world.